A 17-year-old arrested in connection with vandalism at the Swaminarayan Temple. 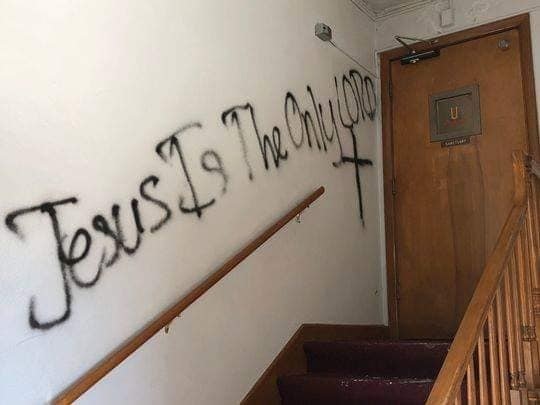 A Hindu temple in Louisville, Kentucky, was vandalized by hate mongers. The incident is said to have happened between Sunday night and Tuesday morning, at a time when the Midwest had been bracing one of the worst cold snaps ever. On Thursday, police arrested a 17-year-old student believed to be responsible for the crime. The name of the juvenile is not being released but the public school student from Jefferson County has been charged with third-degree burglary and first-degree criminal mischief. Local reports suggest that suspects entered the temple premises and sprayed black paint on the statues of deities. Window panes were broken and walls were painted black in an apparent hate crime. A knife was left stabbed on the chair and inappropriate graffiti was scribbled on the walls. The incident has sent shock waves among the Hindu and Indian American community across the United States.